Officer Caesar R. Goodson Jr., Officer Edward M. Nero, Officer Garrett E Miller (top L-R), Officer William G. Porter, Lt. Brian W. Rice, Sgt. 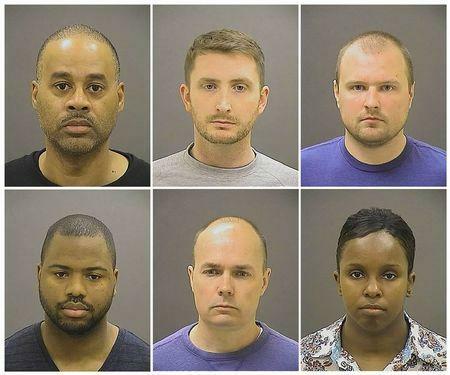 Alicia D. White (bottom L-R), are pictured in these booking photos provided by the Baltimore Police Department. Baltimore’s chief prosecutor charged one police officer with murder on Friday and five others with lesser crimes in the death of a young black man who suffered a critical neck injury in the back of a police van, a case that fueled new anger over police conduct in black communities. The swift decision by Marilyn Mosby, who has been in the position only since January, to charge the six officers in the death of Freddie Gray caught many by surprise in a city that experienced its worst civil unrest in decades on Monday night. Mosby made her announcement hours after the Maryland state medical examiner had ruled the death a homicide and a day after police handed her office the findings of its internal review of Gray’s April 12 arrest. Caesar R. Goodson Jr., a black officer who drove the police van, was charged with second-degree murder, an offense that carries a maximum penalty of 30 years in prison. All six officers – three black and three white, five men and one woman – posted bond after their arrest Friday and were released from custody. Their union rose to their defense. “We are disappointed in the apparent rush to judgment given the fact the investigation into this matter has not been concluded,” said Gene Ryan, president of the Baltimore Fraternal Order of Police. Mosby, a 35-year-old African American, whose family includes generations of law enforcement officers, rejected the union’s call for a special prosecutor. After a convulsive week, thousands of demonstrators marched through the majority black city on Friday evening, with many believing their mostly peaceful protests over two weeks had prompted Mosby’s decision. “It was the people, it was the people out in the streets that made this happen,” said Rev. Osagyefo Sekou, a civil rights activist. Rioters burned buildings and looted stores in Baltimore on Monday night after Gray’s funeral, and protests spread to other major cities in a reprise of demonstrations set off by police killings last year of unarmed black men in Ferguson, Missouri, New York and elsewhere. Gray, 25, sustained his fatal injury while riding in a police van, the prosecutor said, citing the autopsy report. Gray succumbed to his spinal injuries in a hospital on April 19. “To the people of Baltimore and the demonstrators across America, I heard your call for ‘no justice, no peace.’ Your peace is sincerely needed as I work to deliver justice on behalf of this young man,” Mosby said at a news conference that quickly changed the tone in the city. Officers cuffed Gray’s hands behind his back and shackled his legs but did not secure him with a seatbelt while the van was moving, a violation of police department policy, Mosby said. Then, with “depraved indifference,” officers ignored Gray’s repeated pleas for medical attention, she said. While the charges brought joy and relief to the city of 620,000, residents cautioned that they needed to see justice served, not only in Baltimore but in other poor communities where young black men believe they are targeted by police. While touring the city to assess the impact of the unrest, Maryland Governor Larry Hogan said he does not recommend the city lift its curfew just yet. Police arrested at least several protesters who defied the curfew. Apart from the one murder charge, the officers faced charges ranging from manslaughter to assault and misconduct in office, which carry potential prison terms of between three and 10 years. Goodson also faces a charge of involuntary manslaughter, as do three others: Sgt. Alicia D. White, Officer William G. Porter and Lt. Brian Rice. All six, including Officer Edward M. Nero and Officer Garrett E. Miller, face lesser charges. President Barack Obama took the unusual step of commenting on charges in an open case, highlighting the importance that the issue of police conduct toward minority groups has assumed over the past year. The incident that has commanded national attention began on April 12, when officers on bicycles made eye contact with Gray in a high-crime neighborhood, police said. The man immediately fled with the officers in pursuit. When they caught up to him, Gray was handcuffed behind his back and dragged by the arms, screaming, into a waiting van, a bystander’s video footage shows. The prosecutor said Gray’s arrest was illegal. Officers had said that he was carrying a switchblade knife in violation of the law, but she said it was in fact a folding knife that was legal to carry. Mosby said the fatal injury occurred after the van stopped to allow officers to shackle Gray’s legs and put him back inside. Officers failed to secure Gray in seat restraints at every stage of the ride, she said. “Mr. Gray suffered a severe and critical neck injury as a result of being handcuffed, shackled by his feet and unrestrained inside of the BPD wagon,” said Mosby. Gray was no longer breathing when he was finally removed from the van, Mosby said. What it is is “cop vs. everyone else”. PS – As an aside, I’ve always held that anyone who wants to be a policeman should never be allowed to be a policeman. Perhaps it could be like jury duty, with respectable ordinary citizens dragooned and shanghaiied into service. J.